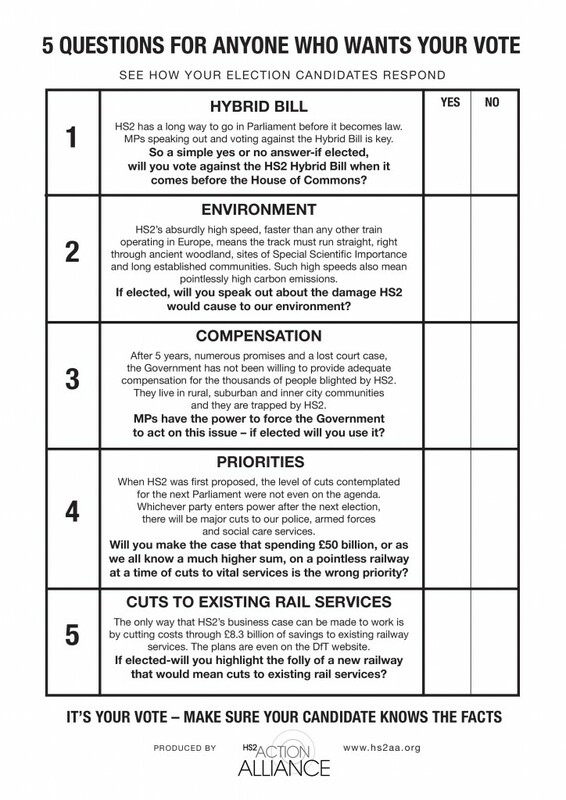 We are writing to you this morning to ask that on the Bank Holiday weekend, please make sure you ask the 5 simple questions on HS2 to anyone standing to be elected to Parliament in your constituency. Please feel free to forward to friends and family across the country to ask them to do likewise. PS We have more information that you can give to your candidates by looking at the ‘election basics’ posts. The UK has two approaches to planning one requiring the Planning Inspectorate and Planning Inquiries and the HS2 approach which bypassed some of the Aarhus Convention Ariticles and principles. Most communities and the public were ousted by the Command Paper before public consultation. Please do not miss your opportunity to change the future. Vote for people who will listen to you not lecture you. The past three months have witnessed preaching from the three party leaders and the reduction in meeting people who oppose their sermons because they experience much different realities. Demonstrate your support for locally foccussed candidates who know your feelings and who you believe you can trust to support your local priorities please.